This is the HobbyBoss 83875 kit in 1/35 scale, of the ‘Russian SU-18 SPH’. In November 1929 ANII K.M. Ivanov, commissioned by the RKKA produced a of an self-propelled gun based on the T-18, as well as the ammunition carrier for it. The prototype was a captured French Renault FT-17BS. 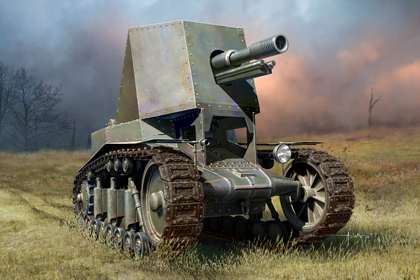 The SU-18 kept the same design as the French vehicle, but replaced the turret with one that resembles a truncated pyramid. The SU-18 used the 76.2mm regimental gun model 1927 with a slotted muzzle brake to reduce rollback. The decision to build the SU-18 was made on June 11 and stipulated the delivery of a prototype by October 10, 1930. However, due to the small ammunition capability and the limitations of the T-18 (a narrow gauge chassis and a high center of gravity) the design was abandoned in favor of larger and better self-propelled gun designs and further work on the SU-18 was stopped. This entry was posted in Kits, Stash and tagged 1/35, 83875, hobbyboss, russian, self propelled, sph, su-18 by Thomas. Bookmark the permalink.